Since 2000 the Ikbal-M-Yos Education Foundation has developed superior human resources in the maritime and offshore oil and gas in Indonesia, especially in Batam, Riau Islands. From year to year until now, it prepares all the needs to realize our vision / goal, namely "Realizing the Competitiveness of Human Resources in Indonesia Jaya 2045 Equivalent and Foreign Resource Tariff in the Maritime Technology Industry Sector by Preparing as Much Professional Human Resource One by Zero as possible with QSHE Spiritualist (Quality-Safety-Health-Environment) Awareness with Our GOD Voice ". Right this year in 2018 we coordinate all activities or needs for Ikbal-M-Yos alumni as well as maritime and offshore skilled workers in Indonesia in one instance is Ikbal-M-Yos Group. Ikbal-M-Yos Group can still exist do too the role of alumni and all parties who participate in Ikbal-M-Yos Group both morally and materially. Quality System adopted at Yayasan Pendidikan Ikbal-M-Yos Batam has been certified ISO 9001:2008 by SGS Geneva since 2004. Our alumni are over 5000 now have been work around the world and it has approved why our alumni had answered the challenge of global competition, because we are Ikbal-M-Yos managed trainings to build competitiveness Quality of Human Resources. Finally, we thrust that our trainings will be met your company’s need. On September 2002 in order to serving the Quality Inspection in maritime and oil & gas Industries, Yayasan Pendidikan Ikbal-M-Yos establish PT. Pakartek Engineering with main business is Underwater inspection & survey, Ultrasonic Thickness Measurement (UTM), Non-Destructive Test (NDT), Technical Inspection and Manpower Supply. Our service approved by ABS, LR, DNV-GL, ClassNK, BV, IRS, APITINDO and Ditjen MIGAS. 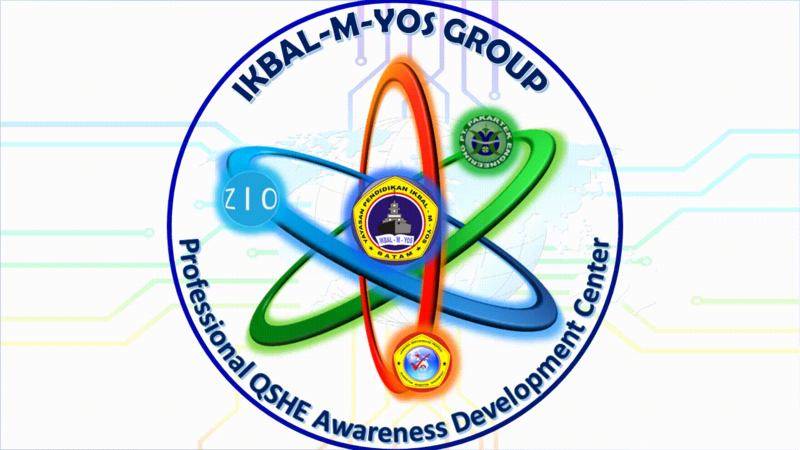 Since December 2016, Yayasan Pendidikan IKBAL-M-YOS establish ZIO Clinic Occupational Health and Medicine (www.zioclinic.com) in order to serving Occupational Health and Safety (OSH) in Maritime, Oil & Gas, Heavy and general Industries that mainly concern in Occupational Medical Check Up (MCU), In-House/Onsite Clinic, KEMNAKER OSH Training for Ahli K3 Umum, Petugas P3K (First Aider), SMK3, Industrial Hygiene Test, Health Risk Assessment (HRA), Occupational Health and Safety Seminar, Talk, promotion and Consultant also AED and OSH Equipment Supplier. Our approval as PJK3 for Medical Examiner and Training from KEMNAKER, KEMENKES, Oil & Gas UK (OGUK), DINKES Kota Batam, IDI & PERDOKI.